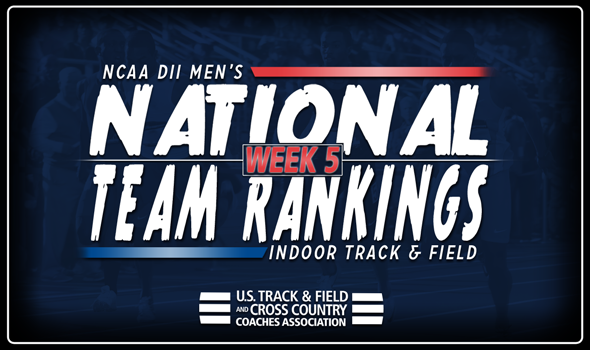 NEW ORLEANS – There’s a new leader in the clubhouse in the NCAA Division II Men’s National Team Rankings. For the first time in program history, Tiffin is the team to beat in the rankings, announced by the U.S. Track & Field and Cross Country Coaches Association (USTFCCCA) on Tuesday. The Dragons jumped up one spot to overtake Colorado Mines in the rankings. Tiffin got a couple of solid marks in field events at the Kent State Tune Up and the Findlay Meet for Everyone. Vincent Vogel hit an NCAA Division II Automatic Qualifying Mark in the long jump with a leap of 7.62m (25-0) while Toryko Grace’s weight throw mark of 20.66m (67-9½) is good for fifth on the NCAA Division II Descending Order List. Ashland also saw a rise in its ranking, as it moved from sixth to fifth. Myles Pringle continued his dominate season, as he posted the top high jump in NCAA Division II this year at 2.18m (7-1¾) during the Kent State Tune Up in addition to running a 21.37 in the 200. That mark is good for fourth on the Descending Order List this year. Adams State (third) and Grand Valley State (fourth) rounded out the top-five. Western Oregon snuck into the top-10, jumping up two spots to 10th. David Ribich put together an impressive 800 run, notching a time of 1:50.83 to rank 12th on the Descending Order List. The ranking is the highest in program history for the Wolves. Pittsburg State, CSU-Pueblo and Findlay sit seventh, eighth and ninth, respectively, for the second-consecutive week. Of those three programs, only the Gorillas made a significant splash on the week when shot putter Bo Farrow’s throw of 18.05m (59-2¾) put him in fifth on the Descending Order List. Outside of the top-10, two teams made up some ground in the rankings, with one of the teams jumping into the top-25 for the first time in program history. Limestone returned to the top-25 in 20th after sitting in 39th a week ago. Marquett Simmons Jr. was highly impressive at the Conference Carolinas Indoor Championships over the weekend, recording the fourth-best 60 time at 6.74 and the fourth-best 200 time at 21.37 in all of NCAA Division II this year. Oklahoma Christian made the biggest leap, jumping 49 spots to 24th for the program’s first-ever appearance in the top-25. The team hit two NCAA Division II Automatic Qualifying Marks at the Arkansas Qualifier when Landon Huslig ran a 47.41 in the 400 and the 4×400 relay squad notched a time of 3:12.20. There are only two more weeks of rankings ahead of the NCAA Division II Indoor Track & Field Championships take place in Pittsburg, Kansas, on March 9-10.